I hope your holidays (Hanukkah, Yule, Kwanza, and/or Christmas) were wonderful and filled with loving family and happiness. And my hope for you, dear reader, is that 2016 is a great year filled with joy shared, and that you've spent the last month (at the very least) being extra kind to others when it counts. (No one can be perfect. Perfect isn't the point. We're human for pity's sake. So, Good When It Counts, is.) For me, that's the reason for the season as it were. I'm not Christian, and Christmas isn't my favorite holiday. Still, I do feel the winter solstice holidays are extremely important--more so and in more ways than we often realize. Oh sure, I hate commercialism. Buybuybuy getgetget shouldn't be the focus but that's often the place where people start. That's fine as long as they get to kindness and generosity. Winter solstice should be about looking out for one another and sharing joy--even if it's only giving a stranger a smile for an instant. None of us knows what that might mean because knowing the important instants when they happen isn't always how the universe works. (And that's why my favorite of all holiday films is It's a Wonderful Life.) Even so, I don't feel that is the biggest reason for the winter solstice holidays. Terry Pratchett summed it up best in one of my favorite novels, Hogfather which was later made into a wonderful film. That's it right there. So, be human. Whatever your faith (or not) believe in the things that aren't true in order for them to renew and become for another whole year. We need Justice, Truth, and Mercy more now than ever before. Our very best to all of you for the holiday season -- wherever you are, whatever you are doing, may your days be "merry and bright." Hello everyone! After a really difficult year, I'm back at the Supernatural Underground and delighted to be here. It's a great time of the year to get things going again. 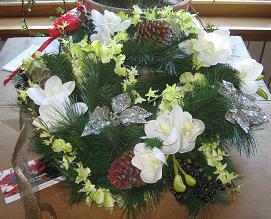 Even with all the stress of preparing for Christmas (I still haven't done my shopping - eek! ), this feels like a time when anything is possible. Miracles can occur. Such as the fact we once again have a good Star Wars movie on the screen. I'm not going to spoiler it for anyone - although I do want to note it's been kinda interesting to see US friends talk about going to the opening night when I knew Aussies already on their third viewing. For once, the time difference has worked for us. But for someone like me, who grew up with Star Wars (I was 7 when I saw the first movie), this new movie is a real gift. I sat in the theatre, almost giggling like a child, wriggling in my seat and shaking my hands in the air with excitement as each old favourite was introduced. I once again got to fall in love with Han Solo, and find a kick arse girl to worship (Rey is the awesome). 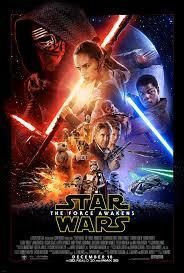 In short - JJ Abrams and the team gave me the gift of being a child again. Of being overwhelmed with happiness. Of being so excited I couldn't sit still. With all the pressure that comes with adulthood (and while sometimes it is fun, sometimes it is damn hard work), it's great to have the moments where we can escape. That's what The Force Awakens did for me. In the middle of a heatwave, with an ear infection building, it still pulled me from the world I knew into a wonderland where everything is fun. Of course, we here at the Supernatural Underground know that books can provide that same wonderful escape. In particular, I've tried to do it with my Jorda series of SF romance (which was actually inspired by Star Wars and in particular Princess Leia). So I want to give you all the gift of that wonderment. 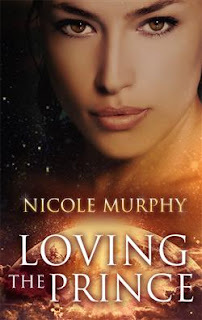 So anyone who tweets a link to this article (make sure you put me in it - @nicole_r_murphy) will be get a free copy of Loving the Prince, book one of the Jorda series. I hope you all have a fabulous holiday time - and let's keep an eye out for those for whom this is a hard time and see what we can do for them. I love that we are drawn to the supernatural genre, immersed in magic, wonder and the 'impossible'. I think that puts speculative fiction readers ahead of the game when it comes to creating personal rituals to change our lives. We've already been there in the pages. It's not a huge leap to go there, in our minds, in our everyday reality. Let's all start 2016 with clear minds and open hearts. Most of our relationship, or lack of relationship, issues rise from an absence of self-love. As Jeannette Maw says, “The universe can only be as good to you as you are to yourself,” and face it, we aren’t always that self supportive. Think about your self talk when you look in the mirror. Are you your own best cheering squad, or do you list the faults and things that need to be ‘fixed’? What about at work? In your creativity? Your daily routine? When you lay awake at night, are you thinking of the things that went right or ‘wrong’? Most of us are in the habit of self judgment, criticism and denigration. Just imagine what signal that sends to the universe? It’s a spell that conjures more of what we don’t want. No British cyclist had ever won the Tour de France, but as the new General Manager and Performance Director for Team Sky (Great Britain’s professional cycling team), Dave Brailsford was asked to change that. Brailsford believed in a concept that he referred to as the “aggregation of marginal gains.” He explained it as “the 1 percent margin for improvement in everything you do.” His belief was that if you improved every area related to cycling by just 1 percent, then those small gains would add up to remarkable improvement. AND IT DID! Read how to alter your daily life by 1% and watch things expand towards success! How can knowing your core values make your life better? It can't, but knowing AND honoring them can! Many know the importance of managing their feelings and focusing on the positive. But sometimes we mange so well, we put up with things that actually are energy drainers. One of the most powerful ways to clear this error is to identify and eliminate the daily tolerations of life. Some examples could include the car tags are expired, the desk plant is withering, the family dog is overdue for a dental, your shoes don’t fit right, neighbor noise keeps you up at night, your mother-in-law drives you nuts, you work too much overtime, you don’t eat a decent lunch, a bulb is burned out in the ceiling light, your credit card is maxed out, etc. The signs of the zodiac can alert us to authentic needs and modes of stress reduction. We each have all twelve signs in our charts, although some will be emphasized more than others. Looking at the natal signs of the Sun, Moon, Ascendant and Ascendant ruler(s) offers a good starting point. Go here to get started! That's it, everyone. Five quick steps to Feng Shui the mind. So apparently its December. I'm not sure what happened. When I started typing a month ago, there were pumpkins, and when I just looked up, there are lights and evergreens everywhere. It is very disconcerting just how fast everything has happened this year. 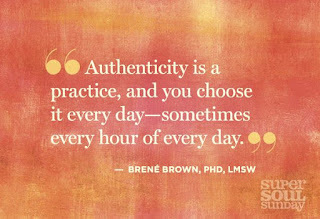 Which is why, my lovelies, it is paramount that you live all moments authentically. As the most heroic version of yourself. If the characters in our stories have taught anything, you get nothing without blood, sweat, and tears. It's hard because it's real. 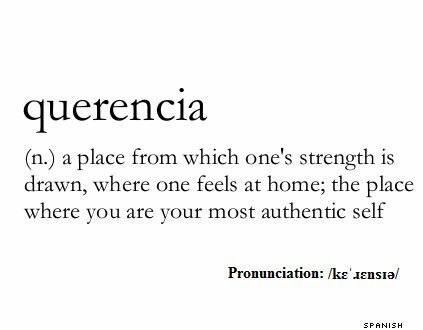 Living Authentically is not for the faint of heart. 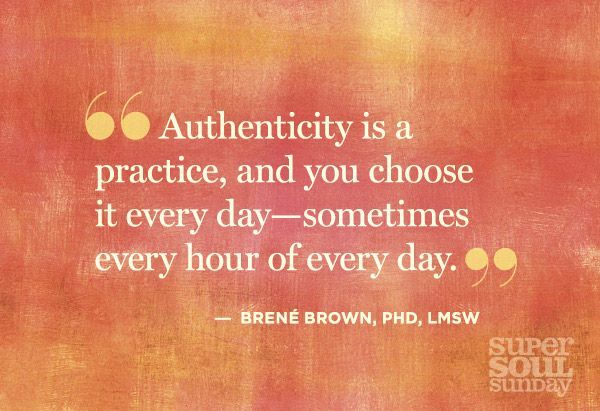 I really like this quote from Dr. Brene Brown. It speaks to me as a writer and as a mother who is constantly giving a toddler options for dinner. According to my daughter, the answer to all life's questions is cheese. Choices test who we are, shape who we are, and prove who we are. 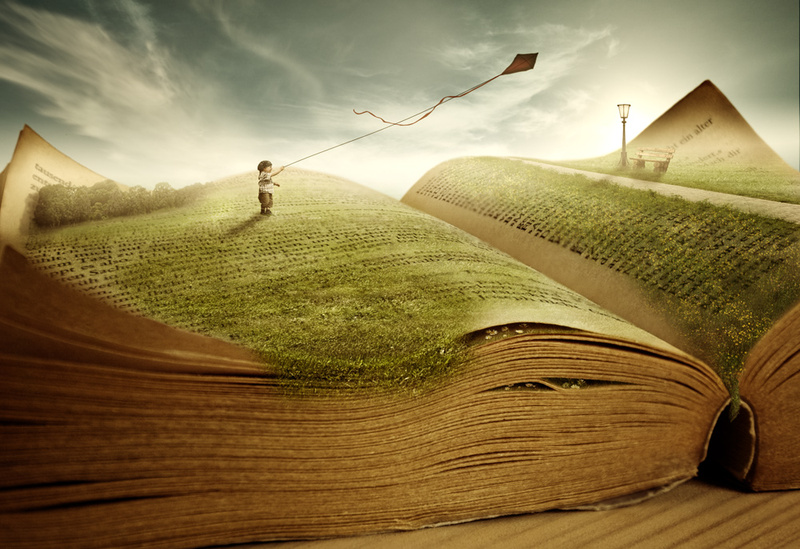 A good writer will always give the hero a choice to be ordinary or extraordinary. A good writer will always give the villain a choice to be good or evil. The choice sets each on a path that will never be the same. There are no do-overs (except in those sci-fi's- but that might be another post for another day). The universe is one long buffet line of choices and, man, sometimes that seven layer chocolate cake looks amazing, but we know the harder path, the better path, should have some veggies and meat. We can't eat cheese all the time. I repeat, Bean, we can't eat cheese all the time. When you get tired, it is so much easier to take the easy way out, be nice instead of being kind, placate to stop the insanity. We let parts of ourselves get stepped on or step on other people because we are not in a good place ourselves. And there is nothing more tiring than looking at a holiday schedule and trying to figure out how you are going to bake pies, get family photos, and still make it to that cocktail hour for work. In moments when I know I'm not being awesome, yes it does happen, I stop and find my happy place. Find something that reminds me of who I am. 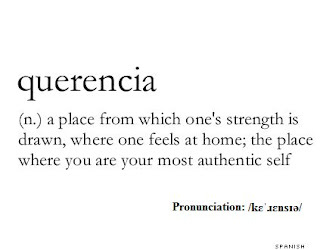 I don't think that querencia needs to be a Fortress of Solitude, but if you've got one, hey, live the dream. I think it needs to be a touchstone. Something that reminds you that life is hard, precious, and totally worth the slower path. Tell the truth, especially to yourself and especially if its funny. Find others who speak your language. Keep calm and Live Authentically. Back in March, I drew the result of a Tuckerization competition, which is where a reader gives their name to a character in a short story or a book. 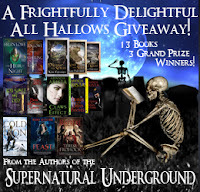 The winner was Beth /Pegasus 358 and I promised the story would be featured right here on the Supernatural Underground. So without further ado, today I give you The Kiss, a short story that features a "Beth" as the main character. Fairy lights rippled across the darkened harbor, illuminating the crowded faces on the boathouse deck. Someone yelled from the adjoining carpark, and a few moments later Beth heard the cough of a car engine. More yells followed, and laughter mingled with the smash of breaking glass. Not like the new, flash houses that dotted the Point above the boathouse. “New people,” Marg at the store had said, and sniffed—just as if Beth wasn’t a summer visitor herself, working on an archaeological dig the next bay over. “Found anything interesting yet?” That was Dave, taking advantage of a gap in the crowd to finally reach her side. He was as local as you could get, even if he was working a summer job, too, researching the harbour’s water quality and correlations to various shellfish populations. Beth took the beer he held out, chinking her bottle against his before taking a long swig. “Here?” she asked innocently, then laughed at his grimace. “No, I knew you meant the dig.” She drank again. “Not yet, unless you count a couple of nails I found today. But they’re not even old enough to catalogue, let alone coming from the mission station. If it was ever here,” she added, momentarily gloomy. Grinning, she downed the last of her beer and headed toward the steps that led directly to the beach, negotiating knots of revellers until she stood on the smooth half-moon curve of sand. The Point cast a long shadow across its far end, the silhouette of a solitary tree marking where the land ended and the harbour began. The patupaiarehe*, the faerie people, were supposed to have come out of the sea there once, and the last survivor of the failed mission had been found beneath the tree, starving and delirious, by a whaling ship’s crew. And a young woman from the Point had drowned herself beneath its shadow when the lover who sailed away to fight in the First World War had never come sailing back again. The tree was ancient and gnarled enough to spark as many stories as it had roots, the long cables twisting down the Point’s rocky face. Beth strolled toward it, and although the music and laughter spilled after her, the waves were a soft, accompanying swish. The path up to the tree was a steep twisting scramble, but the rising moon was bright enough to see by. Once Beth reached the top she saw the moon track, a silver-gilt path across the night harbour. Another narrow beach lay on the headland’s far side, almost immediately below her, and she saw there was a boat beached just above the surf line. The man beside it was standing in the creaming foam, drawing in what looked like a net. He was wearing ragged, cut-off jeans, his bare back a play of moonlight and shadow in the uncertain light. But he must have sensed her presence, because he turned, holding the net in one hand while the other gestured in equal parts greeting and salute. Summer girl… Beth felt as though a thread spun of moonshine and phosphorescence was drawing her down to the dark figure below. He was smiling, she could sense as much as see that, and when he extended a hand to help her down the last zigzag slither, his fingers were unexpectedly warm. But he did not relinquish his clasp once she reached the beach, and now the thread between them was electric, its current leaping between their joined fingertips. Still smiling, he leaned in close and kissed her. His lips were silk and salt and the moon’s cool fire, as Beth was on fire, kissing him back. His hands were on her hips now; her palms exploring the play of muscle across his back as his lips drew her in deep, deep… The rush of memories that came with the taste of the sea on his lips, and the depth of the kiss, was like being caught beneath a wave and swirled violently about, first one way, and then another. A part of Beth was still herself, kissing the stranger on the moon-dark beach; the other was the procession of women who had been drawn to the exact same tryst, time after time. “Sometimes I save them.” The whisper was quicksilver in her mind, the flash of a fish leaping between water and air. In that moment Beth was the last survivor from the lost mission, delirious with thirst and hunger as the voice of the sea lured her here, here, here to this headland with its solitary tree. But she would not have lived to be rescued if the young man who came out of the sea at dusk had not breathed in life with his kiss and left a gourd of fresh water at her side. “And sometimes I do not.” Now Beth was the young woman who had gone to the Point to mourn her lost lover and been drawn into deep water with the night—only to float back in on another dawn, wrapped in the seaweed shroud of her hair. Lured by a kiss and drowned, as Beth was being drawn in, her mouth and body melded to the young man from the sea while the waves broke in a welter of foam around both their knees. No! The part of Beth that was still herself tried to pull away, but the arms about her tightened and the man whose lips still held hers took another step back, so the next wave was a slap against their hips. Now the quicksilver thread was laughter, and despite the part of her that was panicked, terrified, Beth was still in thrall to his dark allure. Folklore eddied through the swirl of memories: tales of patupaiarehe and selkies, of water horses and the Old Man of the Sea: faerie folk in all their guises. 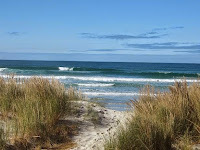 Now the waves were breaking about their waists—but as the swell rocked them both, Beth managed to slide a hand free and into her pocket, groping for the two disdained nails from today’s dig. She had thrust them into her pocket and forgotten them, but now her hand closed convulsively around their cold iron. The young man’s hands dropped away from her and his head arched back, freeing Beth’s lips as he hissed like a cat, his shape fraying into something ancient and wild, shaped out of bone and sea kelp. Her fingers still clutched about the nails, Beth staggered backward, out of the water and past where the boat lay beached—only now it was no longer a boat but a log, draped about with seaweed. She circled well clear of it, her eyes still on the figure in the surf. His eyes glowed, luminous as mother-of-pearl, but the rest was dissipating into spindrift and the night’s shadow. “Presumption…” The cat’s hiss was in her mind, but the eerie eyes were fading now, too. By the time Beth reached the tree again the harbour was as she had first seen it: the moon tracking its path across dark water, with only a log beached above the high tide line. Shuddering, she drew in deep steading gulps of air and balled her fists to stop them shaking—but she made sure she held onto the nails. “Beth! Hey, Beth!” Dave’s voice called up to her, but there were others with him, Jess and the whole crowd of dancers laughing and strung out across boathouse beach. At least one of them had a torch, spinning its beam around like a spotlight. 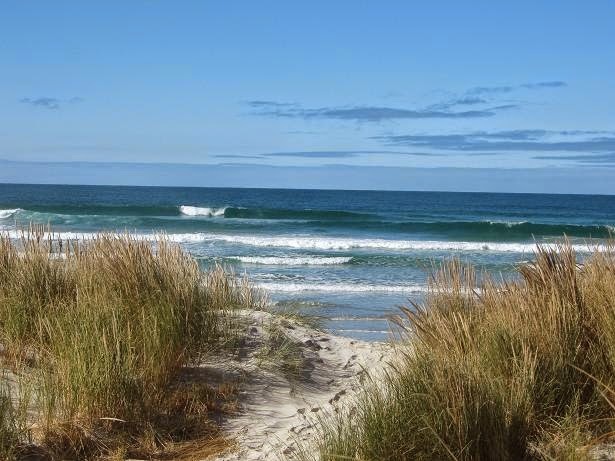 “We’re going to have a bonfire here on the beach. Come on down!” Jess called out, although she sounded grudging. 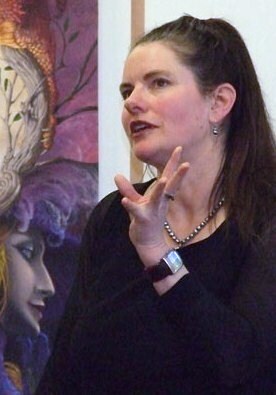 Helen Lowe is a novelist, poet, interviewer and blogger whose first novel, Thornspell (Knopf), was published to critical praise in 2008. Her second, The Heir of Night (The Wall Of Night Series, Book One) won the Gemmell Morningstar Award 2012. The sequel, The Gathering Of The Lost, was shortlisted for the Gemmell Legend Award in 2013. Daughter Of Blood, (The Wall Of Night, Book Three) is forthcoming on January 26, 2016. Helen posts regularly on her “…on Anything, Really” blog, occasionally on SF Signal, and is also on Twitter: @helenl0we. This post was going to be about monsters, but it's not, because things are happening all at once again, as they sometimes do in my life. Due to these mitigating factors, this will be a much shorter post than my previous two. 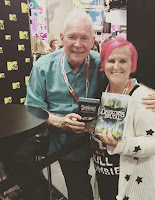 Initially, I had wanted to talk to you about the importance of monsters in fiction. However, I am under a deadline, and it's the end of NaNoWriMo so I figured most of you were under deadlines, too. Anyway, I thought I would impart a bit of writing advice to you. Or make that non-writing advice, as the case might be. If you participated in NaNoWriMo, I'm sure you're excited about your story. You should be. Writing a work of fiction can be a major undertaking. Whatever else you do, finish your story. If you intend to submit your story for publication, I would like to make a suggestion. this will be the hardest thing you will do, but I suggest that you set your story aside for one week at the very least. One month is optimal. Don't look at it. Don't think about it. Write something else. Start a blog. Play on Twitter. Take a workshop. Read. Read. Read. Read books and stories within your genre and outside your genre. You will be amazed at the things you see when you go back and read it after being away from it for a week or more. You will find missing words, badly phrased sentences--sentences that sounded so profound in your head when you first wrote them now seem trite and underdeveloped! You will discover poor transitions between paragraphs, and scenes that were fun to write, but don't actually move the plot forward. By leaving the manuscript alone for a period of time and returning to it, you will find the themes that stand out clearly, and the muddled subplots that need to be eliminated. This past summer, I was on a deadline to complete Without Light or Guide and did not have the luxury of a week away from the manuscript like I had with In Midnight's Silence. The difference between the two was that Without Light or Guide took a lot more editorial guidance and rewrites than In Midnight's Silence. With my last novella in the series, I had the luxury of that week. I'm rereading the manuscript now with an eye toward clarity and plot. I'm catching simple errors and more complex ones in order to fill in the story so that it reads more smoothly. So at midnight on November 30 (or on the date you finish the first draft), step away from that manuscript. Let it simmer. At the end of the month, you'll be able to see precisely what the story is missing, and you will make it better with each pass. As a writer, I'm interested in how language works, not just English. Mind you, not interested enough to be good at grammar. But motivated enough to be able to play with/make up words and even fake fantasy languages. So, that's why as I was running my errands the following story on NPR caught my attention. It was about a man who, at age 27, had no language. Ildefonso had been born deaf and had been isolated. No one taught him language. Susan Schaller ran into him at a university and ultimately began to teach him. As fascinating and depressing and inspiring as Ildefonso's story was, the podcast then moved on to other interesting, but related ideas. Questions about how language affects how the human brain works. Questions about how communication happens--even to a certain extent, empathy and even internal thought. As someone who is interested in dialog, communication, and psychology, it was incredible to hear and consider. Radiolab.org has two podcasts on their site. The first is primarily about Ildefonso. Listen to it. Then move on to the next podcast. The second is about a group of children living in Nicaragua. In 1978 Nicaragua didn't have an education program for the hearing impaired. Like Ildefonso, these children didn't have language. A program was established for them, and they were grouped together. They began to communicate with one another, but everyone had different gestures and short cuts. That's when a wonderful thing happened. They began to form a new language. The interesting thing is that no one had ever seen a language being born before. The first generation of speakers had a limited vocabulary that involved more movement of their bodies. By the time the fourth generation of speakers came along, more words were added and the guestures became more efficient. What interested me the most was the part where they discovered a connection between having multiple words for something and understanding it on a deeper level. I'm not really doing the story justice. You really should take the time to listen. It's incredible. It's also inspiring in all sorts of science fictional ways. I'm dyslexic and pretty much universally bad at grammar, punctuation, and spelling. [pause] Yeah. I said it. And hey, I'm a professional writer. It just goes to show you what one can do with a more than healthy dose of bloody-mindedness. Only a little. Not much. I'm no Tolkien. But it is part of the gig as a fantasy writer. If that's what you want to be, I'd highly recommend taking some non-English language classes. You don't have to be fluent, not even remotely, but you do need to understand how other languages function. 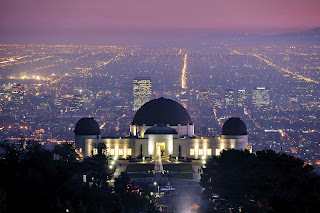 Most people that talk about Griffith Park are usually bringing up the Observatory, which would make aliens come to mind, if we were talking weird stories, I suppose. But actually Griffith Park's most famous markers could be seen as the strange by-products of a curse laid on its soil in the 1860s by a blind woman who'd been left destitute. The area of land that incorporates Griffith Park is much larger than most people realize. It was once owned by the Feliz family, but there was a dispute in the passing down of the land when the patriarch, Don Antonio Feliz, died. Many say he was tricked in his fevered stupor from smallpox, and bequeathed the land to Don Antonio Coronel under much pressure and duress. Needless to say the destitute women left behind with nothing weren't thrilled. His blind niece, Dona Petranilla, put a heavy curse on the land and everyone involved with the dirty deed. Legend says that she died in the weaving of the dark magic. As the land was passed on the cattle on the land died, the grain burned up when lightning kept striking, grasshoppers destroyed the remaining crops; at every turn the land lost value. Family members died young and went bankrupt, until the property was sold, then sold again a year later, then again, until it ended up in the hands of Colonel Griffith. 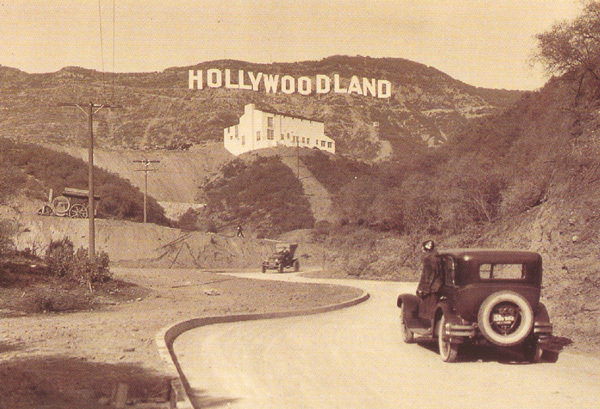 Today the land consists of the Observatory, the Greek Amphitheater, the Los Angeles Zoo, the Museum of the American West, the Travel Town Train Museum, two golf courses, a merry-go-around, countless hiking and horse trails, and the Hollywood sign. The supernatural stories that emerge from the land are all over the map—quite literally. 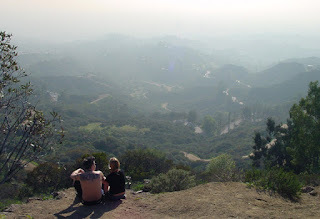 The Hollywood sign has the ghost of a failed actress, The Zoo is haunted by the souls of dead animals, and Don Antonio Feliz still laughs atop the rocks overlooking the Park. Ghosts run rampant everywhere, it seems, as if the curse holds their souls captive to torment the living. But, by far, the most interesting and bizarre story to come from the cursed land originates in the picnic area off Mt. Hollywood Dr. 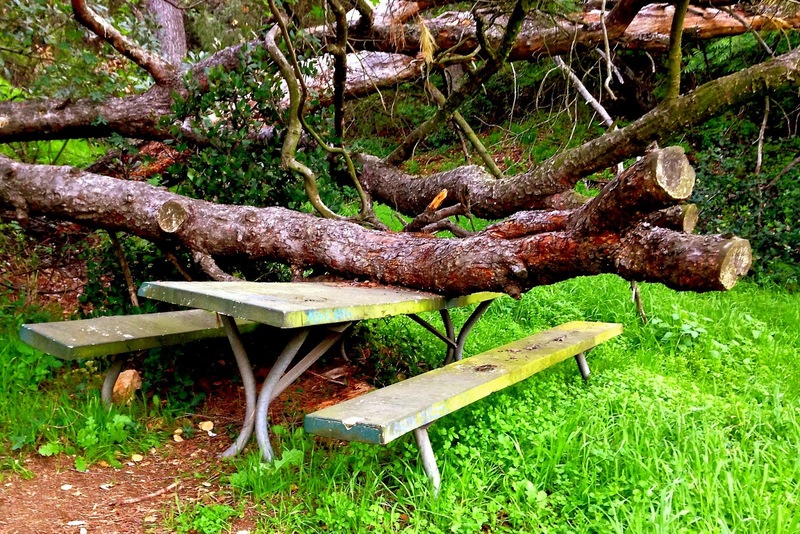 The story of haunted picnic table, to be exact. 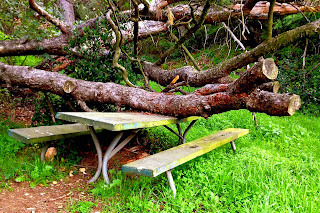 In 1976 a young couple was making out on said picnic table when a large sycamore tree fell on them, killing them both. Yes, that's right. The tree killed them. On Halloween night of all nights. The ashes of the young couple were sprinkled onto the spot of their gruesome demise by the family, in memory, allowing them to be together forever. But it also seems to have created a problem. When the city came out to trim out the dangerous tree, they didn't get very far into the process until the tree shook and groaned at them. The job of removing the beast was left undone for decades. The city worker even filed out an incident report. And to this day it remains, the ashes and souls of the couple said to have become a part of the odd sculpture of table and branches. High concept: it can lead to a breakout novel or film. Given that, it's not hard to guess why writers want a clear concept at the core of their work, but pinning down exactly what that means can be challenging. I've heard a lot of mini, fractured definitions, but every writer, and reader, knows what high concept is when they see it. Still, that's not a Webster definition. You don’t have to slap your reader in the face with your concept - that's best avoided - but the writer needs to know what it is, to stay on track. My favorite support for this is with the tagline - the short-short sentence or catchphrase that resonates with the story's core values. You can see that the tagline doesn't include the full heart, essence, premise, design or images of the story, but if it has the same vibration, it will inspire readers to pick up the book (and writers to keep writing them). Once in the pages, or theater, the concept works invisibly behind the text and images to sweep the audience away. Sup authors, I'd love to know what you're working on now. Do you start with a tagline in mind? A core concept to keep you on track? Her latest release is "Blood and Water" in Supernatural Underground: Vampires Gone Wild. "Daughter Of Blood" (The Wall Of Night Book Three) Now Stars On My Website! 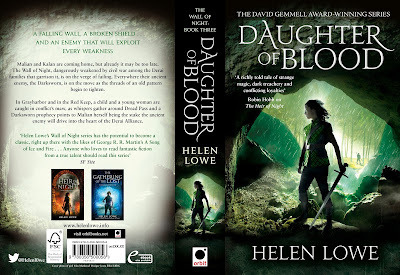 Daughter Of Blood, The Wall Of Night Book Three, is coming --- on 26 January, in both the US and UK: w00t! To herald this awesome event, I've now given Daughter Of Blood star billing on my website. The publication date, together with both the US and UK covers, are highlighted on the home page, here. And there is also a dedicated Daughter Of Blood page, joining those created previously for The Heir of Night and The Gathering Of The Lost --- exciting! "The three hooded figures came up Grayharbor’s Sailcloth Street just as the rain swept in off the sea for the second time that day. The deluge brought a swirl of leaves and rubbish down the deep gutters on either side of the cobbled thoroughfare, and all three leapt for the portico of Seruth’s temple where Faro had taken shelter. He heard one of the strangers curse as his boot came down in the flood. The fine black leather was soaked in an instant, and the man cursed again as he followed his companions into the porch. Faro moved further back, into the corner closest to the temple door, wary of the long black cloaks and deep hoods that did not fall back even when the newcomers sprang for shelter. They were carrying swords, too. He recognized the shape of hilt and scabbard beneath their cloaks and knew that likely meant other weapons as well ..."
Year of living authentically: My writer brain's favorite time of year. National Novel Writing Month is an online effort to increase creativity across the world by sponsoring a challenge to write a 50,000 book in a month. Yep. 50,000 words in 30 days. That is roughly 1700 words a day. Depending on your writing speed that is 2-4 hours a day working on a novel. Or 12,000 words a weekend. Its a lot of writing, but it does something to my writer brain. I love the accountability of it all. I love that I can look at my region to see how we are doing in compared to the other states and countries. That I get pep talks from other NaNoWriMo authors. I get to contact other writers in my area. I get to see there are other crazy people out there like me who love the process of creating something new (though a bit slap-dashed- NaNo is not about perfection). I get excited about the creative side of writing versus the business side of publishing that can seem like a void that makes your eyes water if you try to look at it for too long. I've been participating in NaNoWriMo for years now. Diaries of an Urban Panther was a NaNo book. But NaNoWriMo isn't for everyone. Its intense and you will forget to eat and YOU WILL LOOSE SLEEP!! And people will think that you are now a robot when you say "Have to go NaNo!" It works for me. The challenge jump starts my brain and gets it going again. Gets my fingers on the keyboard and my brain into that creative sweet spot where perfection and self-doubt don't exist. 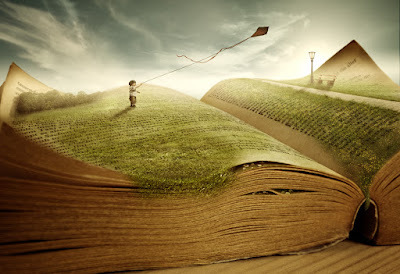 Reminds me that I am not alone in the quest to understand my world through story. If you haven't heard of it before, click on the link above. If you have heard of it and think that we are crazy, we are. If you've been itching to maybe try your hand at the creative life, please do! Your story is important. Have to go now: NaNo-ing! To the Writers Cave-- see you in 30 days! 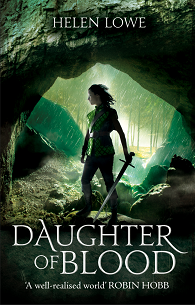 From the UK with Love: More Daughter Of Blood Cover Fun -- *Plus* An Excerpt! Tis only 3 months now until Daughter Of Blood, The Wall Of Night Book Three, is out, out, out — on both sides of the Atlantic. In the meantime, the good folk at Orbit UK have been working hard to get to an all-systems-are-go final cover for us today — and here it is! Not just the front cover, but the spine and back cover, too, and complete with an updated synopsis. Way to go, Team Orbit! Doesn't it look great; atmospheric and just a wee bit eerie, in the best Gate of Dreams style. “…Malian gathered herself. Breathing in the resin of the pines, mingled with acrid earth, she brought the two places together in her mind, folding the distance between them. For a moment she stood poised between the quiet stable with its scents of horses and leather and hay, and the darkness beneath the pines with its thickly layered needles and scattered cones. She smelt sheep dung, too, scattered amongst the tree roots—and opened her portal, out of the stable and into the hollow in the foothills. w00t! We Have Halloween Giveaway Winners! It's been exciting, it's been spooky, you've all gone out and helped spread the word — but now it's time! And a big Supernatural Underground thank you to everyone who participated. Eileen, Melissa, Jennifer: Terri Garey will be in touch so we can get your prizes to you, so don't forget to check your email for that. Happy All Hallows Eve, everyone — may it be spooky and may all your books go bump in the night! 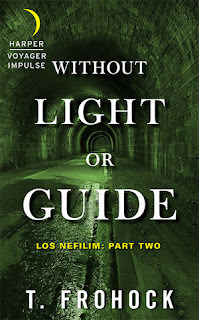 On November 3, 2015, the next installment of my Los Nefilim series, Without Light or Guide, will be published. 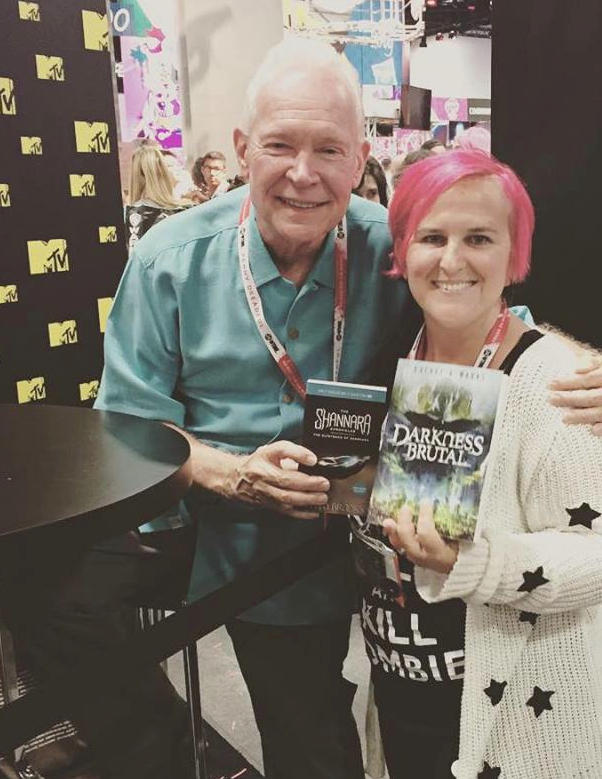 I've been having a great deal of fun with this series, so I thought I'd talk a little bit about some of the influences behind the novellas. When I was first approached about writing novellas, I immediately thought of the old pulp novels of the 1930s, which eventually morphed into radio serials. These were short adventures that could easily be digested in one or two sittings. They were heavy on adventure and light reading, which made them all the more fun. Although it was before my time, my father turned me on to The Shadow by telling me about the radio serials he'd loved as a child. There were several different serials, but for some reason, my imagination latched onto The Shadow and wouldn't let go. The character of Lamont Cranston sounded mysterious with a supernatural edge. Unlike detectives such as Sam Spade, the Shadow had psychic abilities that enabled him to "cloud men's minds" so they couldn't see him. The Shadow was way cooler than Batman and more debonair than Bond. His mythology changed as his story moved from print to radio and finally to film. He began as World War I aviator Kent Allard, who faked his death and finds his true calling as a vigilante crime fighter. Eventually, he assumed the identity of Lamont Cranston, portraying himself as a "wealthy young man about town." Cranston had a rogues' gallery that incorporated everyone from gangsters to super-villains. The radio shows were filled with sound effects and wonderful narration. The Shadow was even voiced by Orson Welles at one time. My dad, who had this marvelous voice, would intone the Shadow's tagline, Who knows what evil lurks in the hearts of men?, whenever he caught us in a prank. The answer, of course, was: The Shadow Knows! So when it was proposed that I try writing a novella, I wanted to do something along the lines of the old Shadow pulps. In the pulps each individual story was always part of a larger narrative. That was the approach I took with Los Nefilim. Since there were a great deal of novels and novellas set in World War I and World War II, I thought I would set my series in 1931, merely a few years prior to the Spanish Civil War. I wanted to place my reader at the beginning of the conflict so I could ease them into the politics of early twentieth century Spain. The hero of Los Nefilim is Diago Alvarez, and much like the Shadow, Diago has magical abilities. Diago and his lover, Miquel, are part of a secretive group known as Los Nefilim (Spanish for The Nephilim--say it like "The Mob" and you've got the right idea). This group of angelic Nefilim monitor daimonic activity for the angels. The only thing is: Diago is not fully angelic. He is part daimon, part angel, and his very unique form of magic is sought by both sides in the conflict between angels and daimons. Like the Shadow, Diago moves through a world of espionage and partisan warfare with a rogues' gallery filled with angels, daimons, and mortals. In the first novella of the series, In Midnight's Silence, the reader is introduced to Diago's world. We meet Diago, Miquel, and Diago's son, Rafael. We get a brief glimpse of the shadowy world of Los Nefilim. In Without Light or Guide, Diago's story continues as he tries very hard to fit in with Los Nefilim, but his daimonic heritage follows him, and seeds distrust among the other Nefilim. Throughout Barcelona, the mortals he has known are dying gruesome deaths. A daimon is loose in the city, and Diago's only clue to her identity is a mysterious phrase written in smoke: She Hunts. On November 3, 2015, the hunt begins. In Midnight's Silence: Los Nefilim Part 1 begins the series and is available now. 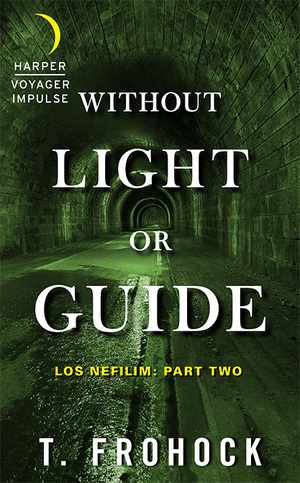 Without Light or Guide: Los Nefilim, Part 2 will be available November 3, 2015. The Second Death: Los Nefilim, Part 3 will be coming your way March 2016. DON'T FORGET THE BIG GIVEAWAY! YOU HAVE ONE. MORE. DAY. TO ENTER!